How can I miss voting this year's Philippine Bl[og] Awards when I actually nominated a bl[og]? What's great is ,the blog that I've nominated, is now an official nominee for the bl[og]gers choice category. So one vote will go to one of my favorite travel and photo bl[og]. I personally like his blog because he captures ordinary moments and makes it extraordinary because of his connection to his subject. I already met Oggie and I can describe him as someone who's naturally witty and humble. Humble in the sense that he always recognizes God as the one behind his talent in photography and writing. 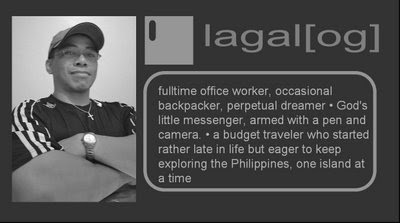 His hobby of traveling, photography and writing has already led him to numerous recognition and achievements. 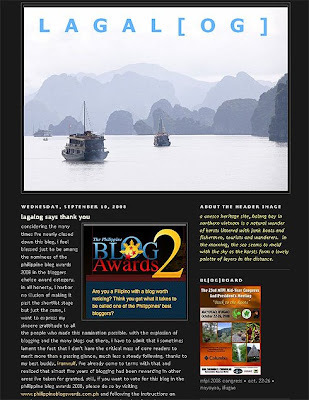 These includes articles and photos featured on travel and photography magazines. I am lucky enough to have the chance to feature him before on my old blog. So I am reposting that online interview here. what lead you to blogging? I’ve had this affinity for writing journals since I was a kid. It was just a natural thing to follow that path when blogging started. When I started over 4 years ago, my blog was just words. But I mixed in pictures here and there over the years. when did you consider photography as a hobby? I always had the inclinations for photography but is just 2 to 3 years ago when I had the means to indulge in it. Now, It’s a cross between a hobby and a quasi-career. I work in advertising and working with professional photographers, I may have picked up techniques here and there so plunging into photography came a bit easily. Connect with the subject whether it’s another person or an awesome landscape. One can be technically flawless but if one doesn’t connect with the subject, the image can be a faultless but emotionally detached. This is a very difficult question to answer since each place is different; each culture is vibrant in its own way. Although I always have an affinity for Mindanao since it is less commercialized. Also faraway places like Batanes or off the beaten path like Biliran and Siquijor. I have a predilection for exploring places less visited by tourist. what makes every trip special? The great unknown. You can only research so much but your actual experience would be different from what the internet or the books may tell you. Either way, you come out richer for the experience. spirituality, how important is that to you? My writing and photography are symbiotically-connected to my spirituality. When I first went into serious photography, I get a lot of comments that there’s an intense emotional feeling viewers get from the images. My only explanation for that is because I immerse myself in God’s creations. I believe that when you connect to the universe, it will open itself up to you. Also, I got into landscape photography to share my awe of God’s creation. Nothing like standing on a mountaintop to feel there’s a power far greater than the biggest ego. what profession would you accept even without pay? Being a guide to the Philippines. When I started my blog, it was just to put my happenings on a journal but I had an epiphany one day and realized that it could be put to good use. So I re-skewed my directions to show that this country, no matter how dreary the news may get, is still a beautiful place to be. for the voting details, you can check out on this link. vote! nice! oggie all the way! alam mo dom. kahit hindi ko kilala personally si oggie eh i will still vote for his blog. why? i tried browsing other blogs na kasali and i found out that yung kay oggie talaga ang the best (no offense sa iba). I've been to his site and he's very talented. His photos are outrageously good. Good luck to him. I visited the site and his photos are outstanding. There are so many interesting posts and I'll be coming back there for sure. dom, i ahve always been a fan of oggie's work, sa list of nominees sya talaga pinakadeserving manalo (i agree with erick). he is such a talented and humble guy. just voted for him at sana talaga manalo sya. good luck ke lagalog! may he wins! ..ndi ko sya kilala heheh sory pero galing nya ha.. Wonderful interview. I am another one to whom blogging appeals because of journaling from a very young age. Only now I add photos, too. deservng talaga yang si oggie manalo. goodluck to him! Good interview and I'll definitely check out his blog. Sounds interesting. naunahan ako ah. heheh.. just kidding..
good tip. sige, pupuntahan ko ang blog niya. Very good interview, I'll visit this blog. That's a great interview. You are always so good to lift up your freinds. and i hope your web friend wins. >erick, all the way nga. ok din ang mga blog ng iba at hopefully yung talagang deserving ang manalo. kaya good luck din kay abou, richard at rachel! >photo cache, yes he is. one of my favorite photographer, blogger and writer. >hi rachel, good luck to you too! my prayer goes to the four of you (oggie, richard, abou and you). >lawstude, oo dami ngang humahanga kay oggie. magaling naman talaga sya at humble pa.
>hi doc rio, oo good luck din kina abou, richard and rachel. >abou, good luck din sayo at ni rachel. may prayer goes to the three of you. >salingpusa, it's really great when your co-bloggers becomes your friend. specially when you have the chance to meet them. you'll appreciate them more. >hi shawie, exactly! thanks for visiting oggie's blog. >ice, i recommend that you check his archives. you'll definitely enjoy reading. dont forget to support rachel, richard and abou as well. >redlan, oo deserving nga. let's also support rachel, richard and abou. >hi carver, that would be great! thanks. >hi equi, no you have the chance to check oggie's blog again. thanks! >richard, good luck din sa yo. >hi atticus, im sure you'll have a great time. check his archives too. >hi sandy, friends deserves the best from us. >jasper, salamat sa pagdaan kahit busy ka. salamat nang maraming-marami for the outpouring of support. just the thought of having you all in my corner makes me feel like a winner already, whatever the outcome maybe. have a good day and God bless everyone! hahaha, bakit ko ba hindi na-type si erick. erick! salamat salamat salamat! >oggie, oo nga. basta nandito lang kami. all out support ito. sana dumami pa ang mga talentong katulad nyo sa blogosperyong ito. kmsta mo ko kay ogi d pogi.